On my forum, I queue up posts in a shared drafts category and use topic timers to automatically post them to the appropriate public category when ready. I have a webhook set up to send data to Zapier to track this content, but it currently doesn’t fire when changing categories manually or via the topic timer. I also have a few categories set for this workflow. Do I have this misconfigured? If not, is this by design? I believe this should fall inside the scope of a topic event trigger, but it hasn’t been implemented yet? 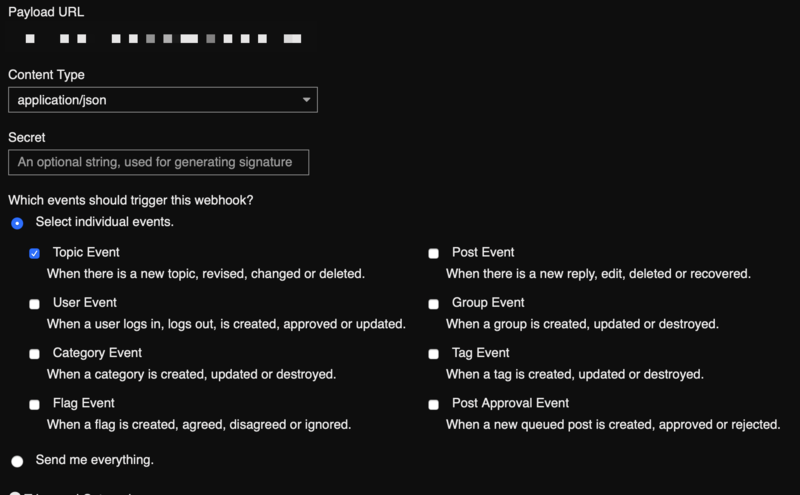 There was a similar commit recently: FEATURE: Trigger topic webhook when topic status is updated. · discourse/discourse@66d620f · GitHub perhaps @tgxworld knows if trigger for topic publish is on the roadmap?